There are several incarnations of buoy style wave energy converters. They are generally divided into two categories: slack-moored and taught-moored. The taught-moored variety have the potential for better performance (because the oscillating portion of the device works against a seemingly fixed, immovable housing), but are susceptible to performance degradations due to fluctuations in tide levels. If the tide level is too high for the mooring line, the oscillating float can become submerged, causing it to not oscillate at all. Similarly, if the tide level is too low, the mooring line can sag causing the oscillating float to rest motionless within the housing. The slack-moored variety isn't affected by tide levels, but is subject to the up and down motion of swells. In order to reduce the effects of the swell motions on the housings, they are usually very massive. Nevertheless, since they are free floating, the swells have a considerable effect on them, thereby reducing their efficiency. 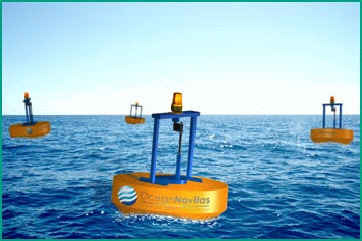 All buoy types are single point absorbers. (See Figure 7) As such, each one requires its own mooring and electrical cables. For buoy farms, the costs are often prohibitive. These increased costs also limit placement to shallow and close coastal waters where wave energy is reduced - due to its proximity to land. Due to these factors, they rank low on the comparative efficiency scale.